The Honorable Sandra Storm is the Legal Aid Society of Birmingham’s 2017 Susan Bevill Livingston Award recipient. This is the third year of the annual award developed because of the leadership of former executive director Martha Jane Patton. The award honors lawyers who have provided extraordinary advocacy and counsel in the areas of indigent defense and pro-bono representation. 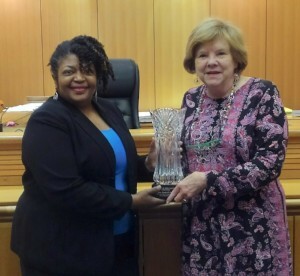 Judge Storm was also selected for her dedication to the children of Jefferson County. The Livingston Award was established in 2014 to honor the life and memory of Susan Bevill Livingston, a wonderful wife, mother, friend and lawyer, who at the time of her death served as the Vice-Chair of the Board of Trustees for the Legal Aid Society of Birmingham. Previous recipients were: William N. Clark, 2015 and Lisa W. Borden, 2016. Another common thread all recipients have is being a dependable friend to the Legal Aid Society of Birmingham and its missions.